Place the Lasko 20-Inch Box Fan in a doorway, corner, window, or almost anywhere to keep cool all day long. This package includes 4 box fans. This fan circulates air about the room, and the 20-inch box fan design maximizes high-volume air flow. Its 3 quiet speeds minimizes noise while giving you control over your cooling. Best of all, Save-Smart technology means this fan only costs 2 cents per hour to run! 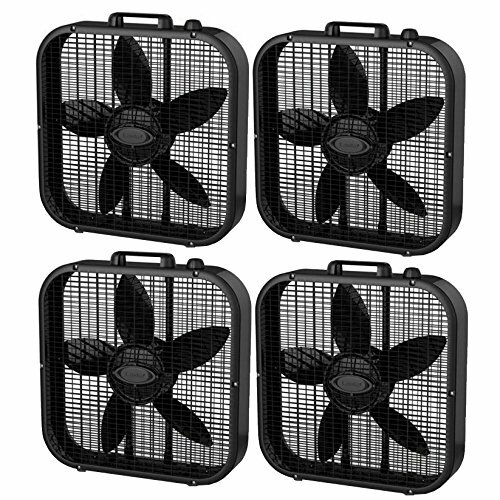 The 20-inch box fan includes a patented, fused safety plug too. With an easy-carry handle, you'll want to take the Lasko 20-Inch Box Fan everywhere you go.